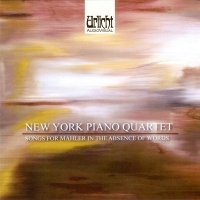 Composer Patricia Leonard informs my label, Urlicvht AudioVisual, that Strangely Close, Yet Distant, her trio for viola, cello, and piano included in the New York Piano Quartet’s Songs for Mahler in the Absence of Words, has been nominated for the American Prize for Composition. Congratulations to Patricia along with the members of the New York Piano Quartet along with recording engineer John Baker and his team! Strictly commercial footnote: download the hi-def .flac edition here. Download the CD-quality .flac edition here. Download the hi-quality mp3 edition here. Buy the CD edition here.